In today's post, I would like to tell you about where I go to satisfy my burger cravings. No it's not Chur Burger (although they make a pretty mean cheeseburger) and it is certainly not Maccas. 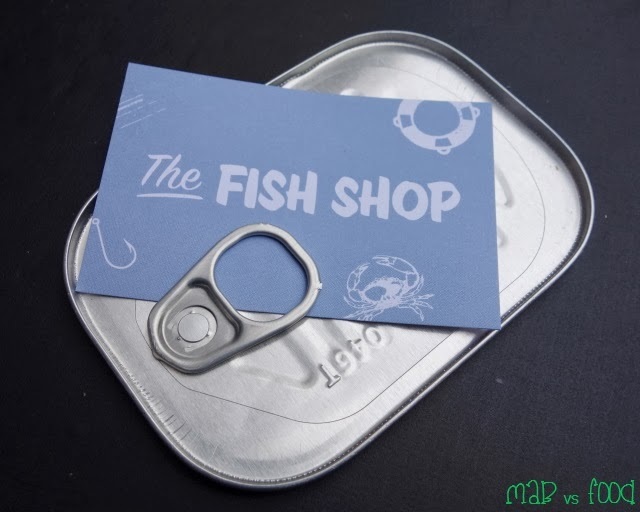 It's a place that you may not suspect... a the Fish Shop. 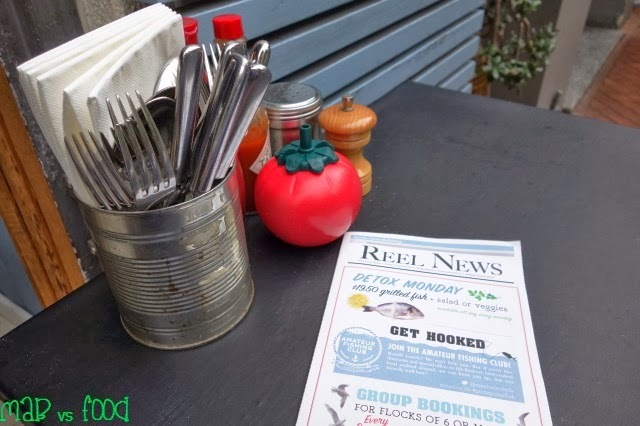 The Fish Shop is part of the Merivale group and is another one of their themed venues. The decor is somewhat tacky and resembles a beach side fish and chips store (even the bathrooms are labelled as buoys and gulls!). 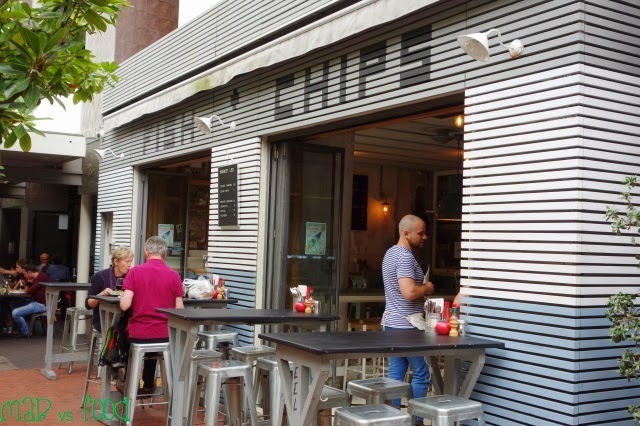 They serve all sorts of fresh seafood and have a hatted chef in Jeremy Strode behind the stoves, but I am here for their burgers, which seems a bit wrong. Don't worry I had their burgers on separate occasions, not all in one seating! Yes I ordered a cheeseburger at a fish and chips store. 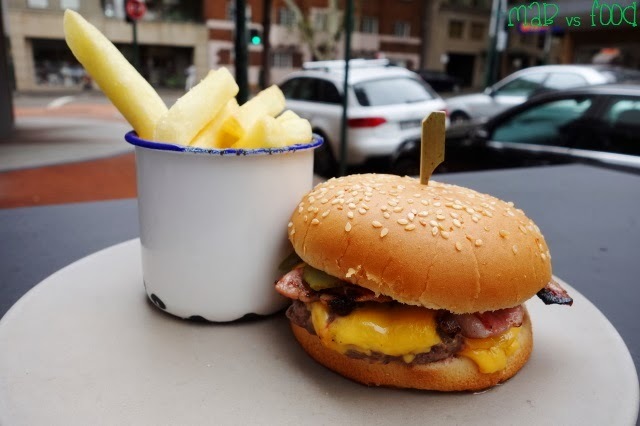 This isn't just any ordinary cheeseburger, it's one of the best in Sydney! This burger is named after its creator, Dan Hong, Merivale's poster boy chef, and this burger is his legacy following the closure of Merivale's Lotus Restaurant at this same venue. This burger is almost legendary and has a strong legion of fans, so it has to be avaliable at this site. 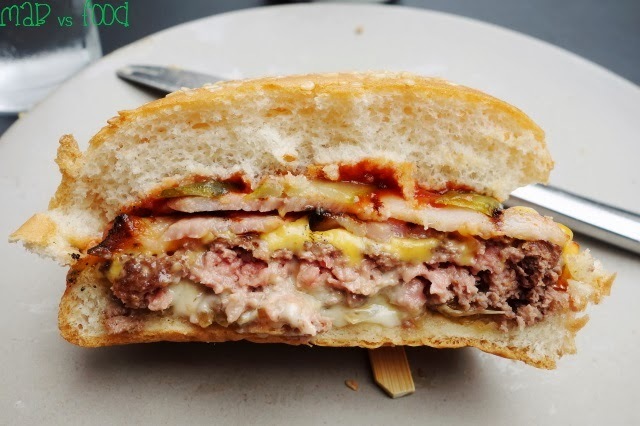 Dan's famous cheeseburger is the bomb and is packed with flavour that's waiting to explode in your mouth! Encased within a soft, fluffy bun is a medium rare beef patty that is juicy and full of real flavour. To go with this patty there's melted American cheese, crispy and smoky bacon, grilled onions, pickles, mayo and ketchup. It was over too quickly, so I think I could have two of these! The burger also comes with a decent side of hot chips. Not far behind the cheeseburger in awesomeness is Fish Shop's fish burger. 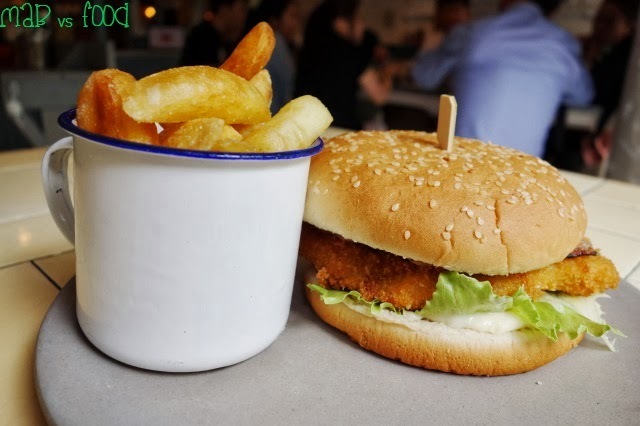 This burger comes with a crumbed fillet of flaky blue eye fish that is actually crispy served in a soft, fluffy bun. Japanese mayo is the best type of mayo for its umaminess. 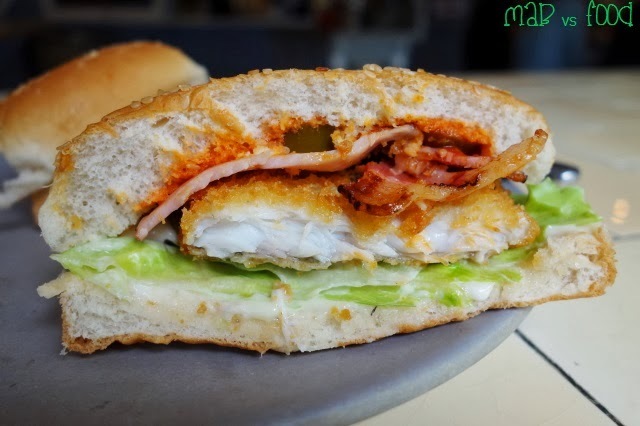 I have never seen bacon or chillies in a fish burger but I adore their addition as they made the burger more tasty and interesting. Like the cheeseburger, I could have two of these! The fish burger also comes with a side of hot chips. There is only a small and simple offering of desserts at Fish Shop. I have tried all of them except the pineapple sorbet and grilled pineapple. Here's what I thought of the other desserts. Who doesn't like ice cream sandwiches? I certainly do! 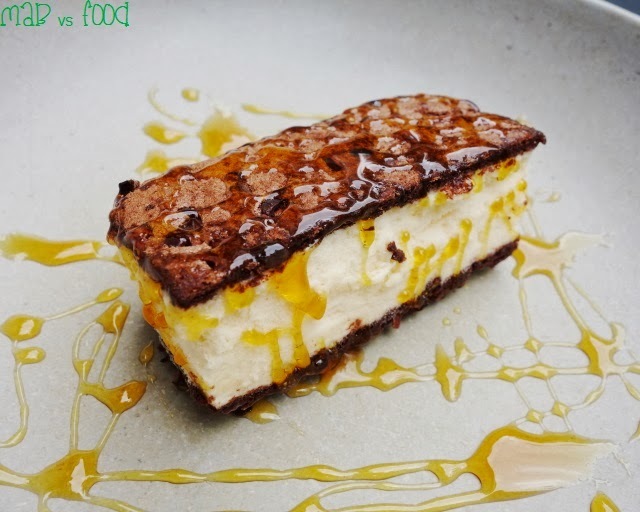 Just love 2 slightly chewy cookies with a slab of mascarpone parfait wedged in between. This one also had crunch cocoa nibs in the cookie. The sandwich was drizzled with a sticky salted caramel sauce. It was nicely salted but I would have liked more of the sauce to go with the sandwich. At $9.50, there are certainly cheaper alternatives out there from Pat and Stick's and Kakawa. This banana split arrived at my table and was not what I expected. There was no whipped cream or glace cherry on sight. 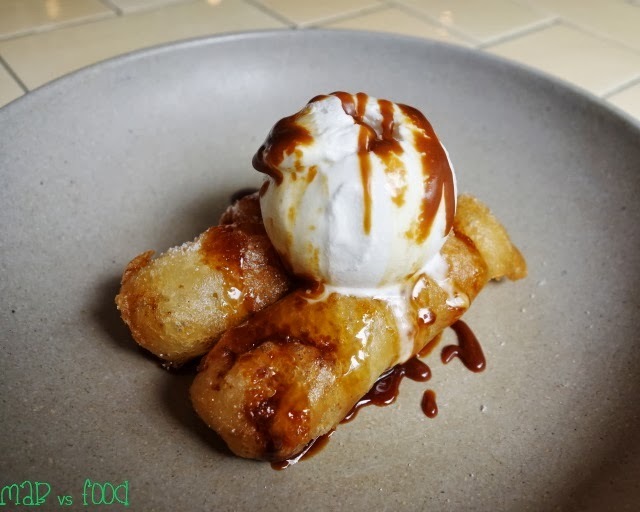 Just a couple of tiny fritters from a sliced banana and a solitary scoop of vanilla ice cream drizzled with palm sugar sauce. Whilst I like the flavour of warm bananas with ice cream and palm sugar, there was just too much batter compared to banana. I ended up scraping off most of the batter and eating around it. I don't think this was worth the $9.50 price tag. I have not tried any of the "proper" seafood options on the menu yet because I am always drawn to the burgers. 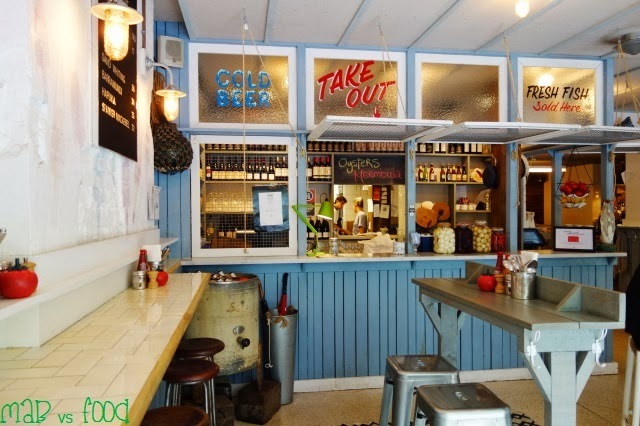 The cheese and fish burgers at Fish Shop are two of the better burger options in Sydney in my opinion. They may cost a bit more than your average burger, but what you will get is a flavoursome burger with quality ingredients that are not crammed with an excessive amount of ingredients. If anyone is in need of desserts, you might want to consider other options nearby as desserts are not really what Fish Shop is about. This burger is not your usual double cheeseburger with 2 slices of cheese. 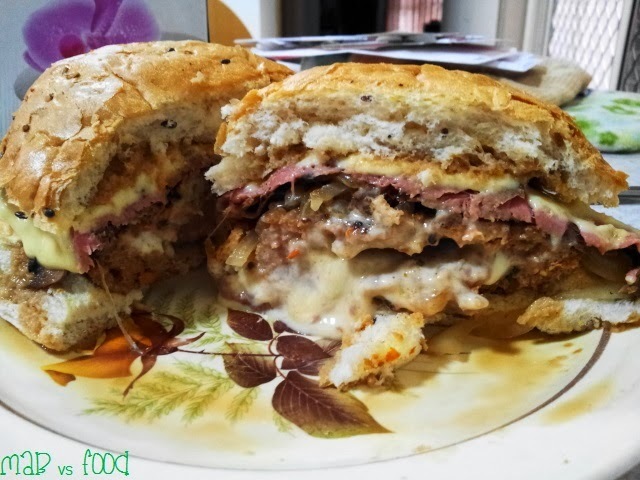 Instead when you bite into this burger, cheese comes OOZING out of the patty. Yes, the cheese is inside the burger! 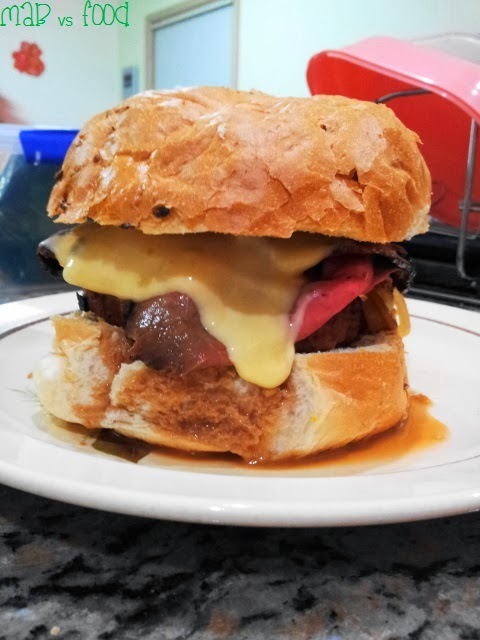 The patty was topped with caramelised onions, slices of roast beef and another slice of melted cheese. My brother tells me drench the burger with gravy for more meaty flavour and then tuck in. I also had some coleslaw on the side to freshen up my palate for the next bite. Gravy was running down my hands and this may be the messiest burger I will ever eat, but the burger was certainly tasty. Thanks man! I will be around when you make this behemoth again.